Team Canada has added Ryan O'Reilly to its roster for the World Cup of Hockey to replace the injured Tyler Seguin. Tyler Seguin's World Cup of Hockey is over before it really even began. The 24-year-old pulled out of the upcoming tournament on Tuesday night because of a lower-body injury. He was replaced on Team Canada's roster by Clinton, Ont. native Ryan O'Reilly. "It's never easy to lose a player to injury, let alone one of Tyler's calibre, but once again, it speaks to the depth of talent in the country to be able to add a Ryan O'Reilly to our team," Doug Armstrong, Team Canada's general manager, said in a statement. It's thought that Seguin might have been injured when he tumbled feet-first into the end boards during Canada's exhibition opener against the United States on Friday. Seguin briefly left that game before returning to action. He suited up again a night later and participated in practice on Tuesday morning, but was evidently not well enough to continue. "While I'm upset that I don't get the opportunity to play, I understand the situation Team Canada is in with a short tournament," Seguin said in a statement released by the Stars. "I wish all the best for that team and the good news is that I'll get to be with my Stars teammates from day one." 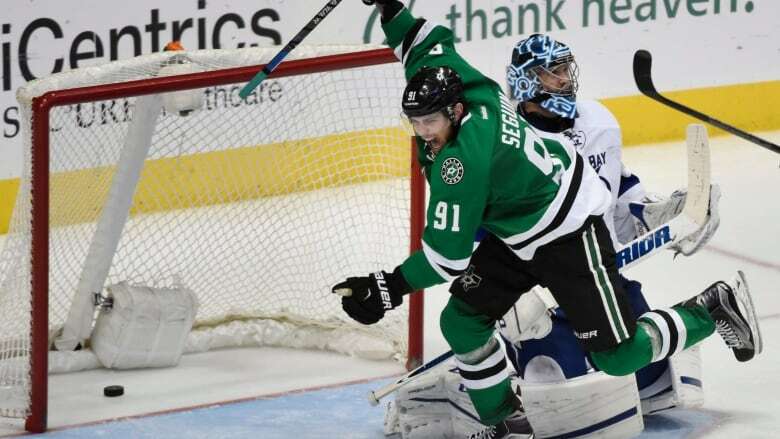 Injuries have stung Seguin at inopportune times recently. He missed all but one game of the 2016 NHL post-season, primarily because of an Achilles injury. His Dallas teammate, Jamie Benn, was also forced to pull out of the World Cup because of injury (core muscle surgery), and was replaced by San Jose Sharks forward Logan Couture prior to training camp. O'Reilly is coming off a solid season for the Buffalo Sabres. An effective centre at both ends of the ice, he posted 21 goals and 60 points in only 71 games for the Sabres last year, while winning 57 per cent of his draws. He's also been a regular contributor for Canada at the world championships, mustering eight points in his fourth tournament this past spring. He doesn't make up for Seguin's offensive ability though. The Brampton, Ont. native has rung up at least 33 goals for the Stars in each of the past three seasons and offered Canada one more game-breaking element. The Canadians are rich with offensive weaponry regardless. O'Reilly is one of only two forwards on the roster (Claude Giroux) yet to post 30 goals in a season, though he came close with 28 markers during the 2013-14 season. In addition to Seguin and Benn, the Canadians have also lost Duncan Keith and Jeff Carter to injury. Team Canada concludes its exhibition schedule against Russia in Pittsburgh on Wednesday night before beginning tournament play against the Czech Republic on Saturday.